If you’ve ever been in a room full of computer geeks, all trying to do work (and fit in some play) at the same time, you know the jockeying for positions near power outlets that can occur. Everyone knows they’re going to be tapping away longer than their computers’ batteries will last, so plugging in is a must. 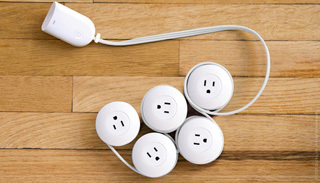 But conventional power strips put all the outlets together, making it tough for everyone to get juice if it’s a big room and they’re not all on the same sofa. Kate Vallon must have had an experience like this, leading to the invention of the Pod Power, now up for presale at Quirky. 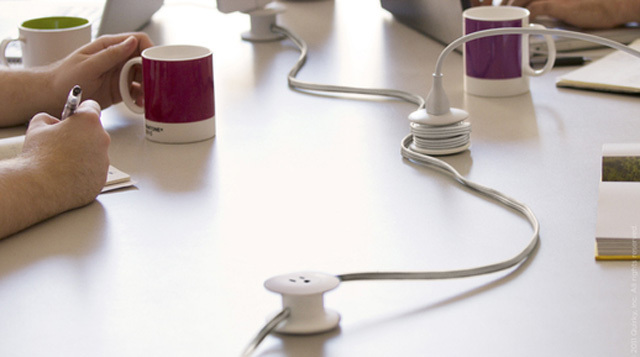 The Pod Power is a 15A power cord with a new idea – there are five outlet pods along its 15-foot length, spaced every three feet, allowing devices to be plugged in closer to where they are actually being used. The pods double as cord spools, allowing extra slack to be wound around them, so there’s not more wire lying around than is needed. The cord will also come with adhesive pads that will allow you to stick the pods on walls or ceilings. As mentioned, this is a Quirky project (which works something like Kickstarter) and the Pod Power will only be produced if the required number of presales (2000 for this item) are met. The presale price is $34.99. Head on over to Quirky and check it out if you’d like to help this idea become a reality. works in the background for sites like GeekBeat.TV, WebBeat.TV, and One Man’s Blog. He is currently attending the University of Texas at Dallas. He loves film, video games, music, animation, technology, and a good conversation with those interested in the same things so feel free to get in touch through the many available social networks.